Nuclear power plant (file photo). The proposed plan by the Federal Government to construct a nuclear power plant by mid 2020 would offer Nigerians a cheaper and stable source of electricity pricing, in the long run, borne out of lower operating costs. This was disclosed by the Russia's State Atomic Energy Corporation (ROSATOM) Vice President for Sub-Saharan Africa, Viktor Polikarpov, at the just-concluded 2018 AtomExpo in Sochi, Russia. This was also corroborated by the chairman and Chief Executive Officer of the Nigeria Atomic Energy Commission (Nigatom), Simon Pesco Mallam. Mallam told The Guardian exclusively: "We have a roadmap and that is by the mid 2020s. We hope we can get a commercial plant and add three more in five to 10 years." Last year October, the Federal Government entered into a mutual agreement with ROSATOM, a Russian state owned nuclear energy corporation, for the construction of a nuclear power plant and research centre in Nigeria. This is with a view to diversify Nigeria's current energy generation mix, which relies mainly on thermal and hydroelectric sources. As to whether Nigeria would be partnering with Russia or not, he said: "We have a good agreement with Russia, but we have not signed any contractual agreements yet. We have signed operational agreements, project development agreements, but not any commercial contractual agreements." Throwing more light on how nuclear energy offers lower operating costs as opposed to other energy sources, Polikarpov explained that it is in view of the fact that the cost of uranium, which serves as nuclear fuel is comparatively low, when compared with fossil fuels used in powering gas and coal turbines. According to him, "even though the cost of constructing a nuclear power plant is quite high, the cost implications of operating them are quite low. The average lifespan of a modern nuclear reactor is 60-80 years. This variable, when taken into consideration, makes the expense of delivering power from a nuclear plant quite low." Addressing the forum, which had a record participation of 68 countries, and had delegations from Ghana, Kenya, South Africa, Uganda, Zambia and Nigeria, Director General of ROSATOM, Alexei Likhachev, noted that more countries are now veering to develop nuclear power. "New growth centres want to enable themselves with access to nuclear power in a fast, high quality and economically attractive manner. This provides a ground for cooperation in commercial nuclear projects; and in applied and fundamental science. It is not mere chance that the theme of this year is, 'Global Partnership - Joint Success'. Alliances are not only possible, they are necessary for finding mutually beneficial solutions," he said. However, there persist fears and criticisms bordering mainly on the dangers of nuclear energy and waste, among others. Others are the cost and danger to the environment. Advocacy groups championing environmental and human rights issues in Nigeria, especially the Environmental Rights Action/Friends of the Earth Nigeria (ERA/FoEN), have severally raised concerns that the project would cause Nigeria more harm than good. They insist that a nuclear power plant is not good for the environment in Nigeria because of the radioactive wastes and the cost of the project, averagely about $20 billion, which is not feasible, as the country cannot finance it. It would be recalled that Akwa Ibom State leaders and stakeholders had sometime in 2015 vehemently rejected the Federal Government's proposal to build a nuclear plant in the state. Two proposed nuclear plants, conceived by the former Goodluck Jonathan administration, was billed to generate over 1,200megawatts each. The proposed sites for the nuclear plants are Akwa Ibom and Kogi states. The people of Akwa Ibom are not buying any of the nuclear plan in the state, and have continued to kick against the proposal since it became public. "We reject anything that is not in the interest of our state and our people. We reject the plan to build nuclear plant in Akwa Ibom State," the president of Akwa Ibom Community, Abuja, Tommy E. Okon said on November 14, 2015 in Abuja in his inaugural address as the 14th president of the community. "We have rejected it before. We are rejecting it now. And we will continue to reject it," said Okon, who was re-elected for a second term in office as the president of the community. However, Polikarpov, regional vice-president of ROSATOM, said all of the concerns are driven by a lack of information. He said when the nuclear plant would be operational, the country would save $14 billion in a year on off-grid diesel generation and improve the value of human life. Brandishing a 2016 report, Andrii Gritsevskyi of the department of Nuclear Energy, International Atomic Energy Academy (IAEA), said that 1.2 billion people still don't have access to energy and 1 billion others have no access to health care due to energy poverty, with Africa making up a great percentage of this number. He went on to add that two million deaths occur yearly due to air pollution and proffered nuclear energy as an alternative solution to the present energy being utilized. The existing energy sources include coal (38 per cent), oil (four per cent), natural gas (23 per cent), bio energy and wastes (two per cent), hydro (17 per cent) and wind (four per cent). Nigeria presently employs coal, oil, gas, hydro and wind to generate electricity but these have proved to be inadequate as consumption demands rise daily. Listing and addressing some of these myths on nuclear energy, Vadim Malkin, a managing partner with Transitional Markets Consultancy, said most of the stories surrounding nuclear energy were false. Addressing the claim of nuclear being expensive and unable to compete with cheaper renewables, he said the Levelised Cost Of Energy (LCOE) of coal, onshore and offshore wind as well as solar are still significantly higher than nuclear as well as the hidden cost of renewables such as storage and so on. He disclosed that coal and gas might look like cheap alternatives now but are more expensive in the long run. Touting nuclear energy as the safest source of electricity, he quotes a 2012 report from Forbes.com, saying more deaths still occur from the use of coal, biomass, natural gas, hydro, solar and wind than from nuclear and it is one of the least polluting of all sources of energy. Addressing the security of supply, he said the LCOE for nuclear fuel is just about eight per cent compared with fossil fuels that range between 60-70 per cent and there has been no single precedent of using nuclear as a political tool. Also, technology transfer and sufficient fuel stock make it technically impossible for the vendor, as vendors cannot take risks of overcapacity on the supply side. Most of the nuclear energy for electricity presently in the world is produced by the United States of America. Neither Nigeria nor the rest of Africa produce nuclear for energy purposes yet. Despite a burgeoning economy and the largest population in Africa, Nigeria's power sector remains one of the poorest in Africa, performing far below the level expected. Over half of the population has no access to grid-connected electricity and those who are connected to the grid suffer extensive power outages. 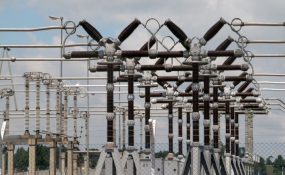 Nigeria's current installed capacity is estimated at around 13,000 MW, only half of this is operational, and only about 5,000 MW reaches the grid. Restricted output has been blamed on gas supply problems, water shortages, grid constraints and breakdowns as well as vandalism and sabotage. According to experts, Nigeria is currently spending roughly $14 billion yearly on off grid, particularly on diesel generators. In view of such major energy deficit, the country is looking for all available alternatives including renewable energy options like wind and solar and lately, nuclear energy. At the moment, Rosatom is working with Nigeria on two planned projects, the Center for Nuclear Research and Technology for which an agreement on cooperation in construction was signed in 2016, and the Nuclear Power Plant project for which project development agreements on construction and operation were signed in October 2017. According to the Chairman/CEO of the Nigerian Atomic Energy Commission (NAEC), Simon Pesco Mallam, the country has concrete plans on erecting its first nuclear plant by mid 2020's but is still putting logistics in place to make this a reality. "We looked round the country, carried out feasibility studies on several areas before settling on Geregu in the Ajaokuta area of Kogi State and Itu in Akwa-Ibom State. Factors like possibility of earthquake, flood or volcanoes, easy access to water and topography were considered before we settled on these places. We also took into consideration, issues like insecurity and insurgency before arriving at our decision." Addressing the fears of a nuclear incidence in light of the 1986 Chernobyl nuclear accident in Ukraine and the 2011 one in Fukushima, Japan, Mallam insists that Russia has one of the best records in terms of nuclear technology. "The Chernobyl incidence you speak of is very old. Those were old reactors that have since been changed and upgraded. As for the Japan own, it was as a result of the Tsunami that knocked off the plant and the technology has been improved upon. "It is because we want to be assured of the highest levels of safety is why we want to partner with people that have experience, that have gone through it and know what is involved. There are several deaths in other industries but nobody is talking about them, why are they hammering on this industry alone?" "We are doing all what is humanly possible to ensure safety. People are claiming we have a poor maintenance culture but this is untrue because we have a nuclear research centre we have been successfully managing for years, located in a university. I am not saying all these because I'm in this industry but we have the highest safety standard apart from the aviation industry. We have put mitigation processes in place and are hundred per cent focused on safety," Mallam said, adding that if a single power plant is decided upon, it would generate employment for thousands of Nigerians. When asked how Nigeria was truly faring compared to the rest of Africa, Mallam admitted that the country "is slow". "If we have a 4.8 GW plant for instance, it will be on everyday and support what we have presently and transmit to heavy industrial manufacturers and core industry users. There are some facilities that are not supposed to be without electricity even for a second, but they are presently suffering. We cannot continue like this. When electricity improves, more investments will come in, industries and manufacturing companies will boom and the cost of manufacturing will decrease significantly."